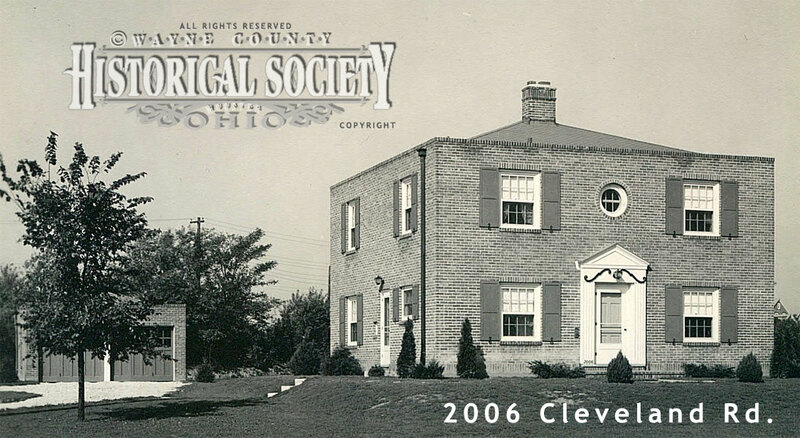 Portrait of the “prize” house given away at the 1935 Greater Cleveland Small Home Show soon after it was re-erected by Bogner Construction in Wooster, Ohio in 1935. Just like people, every house has a backstory. The square brick house with a small distinctive circle window located at 2006 Cleveland Rd. in Wooster, Ohio is literally a “prize” house. Not only was it an award winning architectural design completely erected from the best building materials available and shown at the 1935 Greater Cleveland Small Home Show held in the massive Cleveland Public Auditorium Exhibition Hall, but it was also given away as the winning prize for a slogan contest running at the Small Home Show sponsored by the Builders’ Exchange. To win the house a person had to submit a slogan that was the most fitting in description of the house. had been selected as the winning slogan entry! However, before she could be declared the winner she had to present the entry stub showing that she had wrote the slogan selected and she had left the stub in another purse at home. After a few anxious hours she found the purse and stub and was officially declared the winner. 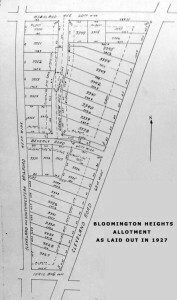 Plat map of the Bloomington Heights allotment consisting of land situated west of Cleveland Rd. and east of the right of way of the C&SW Railroad, north of Ihrig Ave. and south of Highland Ave.
Having won the house, Daisy Scott was not quite sure what to do with it. The house had to be removed from the Exhibition Hall when the show was over and she could not stash it in the back of her car and drive off with it. 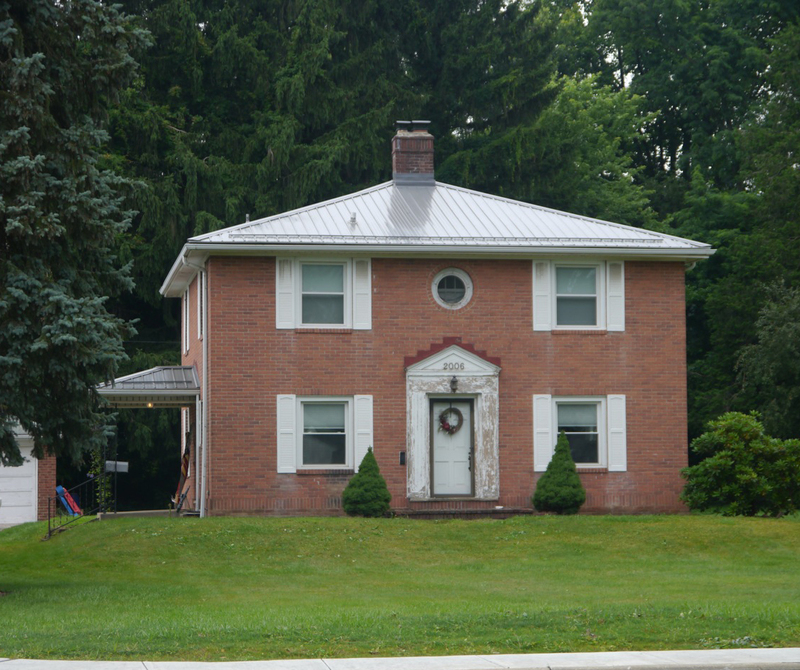 So, Daisy called her sister, Ida May Scott a resident of Wooster, Ohio who worked as a court stenographer in the Wayne County Common Pleas Court, to get her thoughts on what she could do with the “prize” house. Together, the sisters, Daisy and Ida Scott, decided to go into a partnership on the house. They would buy a lot of land in Wooster, pay to have the house dismantled and shipped to Wooster, and contracted Theodore Bogner to reassemble the house. It was no small feat but the sisters did it. They bought lot number 3327, for about $1,545 according to tax stamps on the original deed, in the Bloomington Heights allotment. 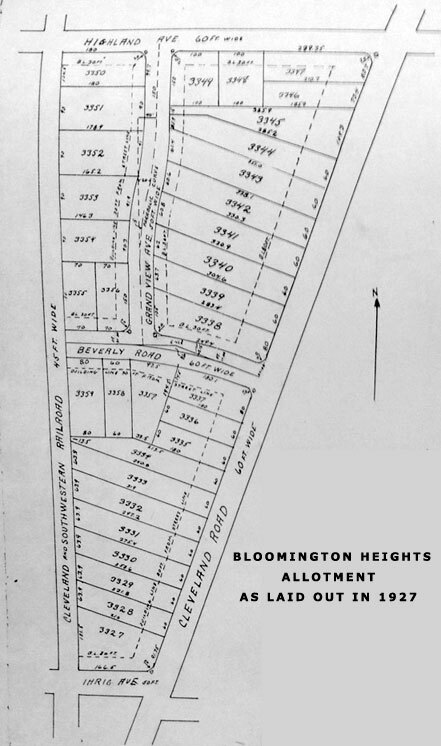 The Bloomington Heights allotment was laid out in 1927 from a 15.26 acre tract of land that had been owned by Nellie Ihrig Barrett and her husband, Leonard A. Barrett which was subdivided into 33 Wooster City in-lots. However, there were some conveyance restrictions and conditions placed on all lots within this sub-division that were in full force and effect until January 1st, 1950. (1) All lots are to be used solely for residential purposes. (2) The main building line of any building or an enclosed porch erected on any lot in said Allotment shall not be nearere than thirty (30) feet to any street line, except those lots fronting on Cleveland Road, on which said Cleveland Road the main building line of any building or an enclosed porch, shall no be nearer than Eighty (80) feet to said Cleveland Road line. 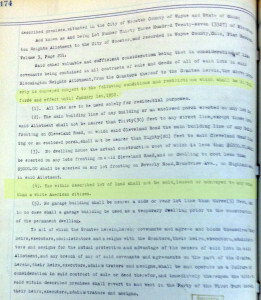 (3) No dwelling house the actual construction cost of which is less than $6000.00 shall be erected on any lots fronting on said Cleveland Road, and no dwelling to cost less than $5000.00 shall be erected on any lot fronting on Beverly Road, Grandview Ave., or Highland Ave. in said Allotment. (4) The within described lot of land shall not be sold, leased or conveyed to any other than a white American citizen. (5) No garage building shall be nearer a side or rear lot line than three (3) feet, and in no case shall a garage building be used as a temporary dwelling prior to the construction of the permanent building. 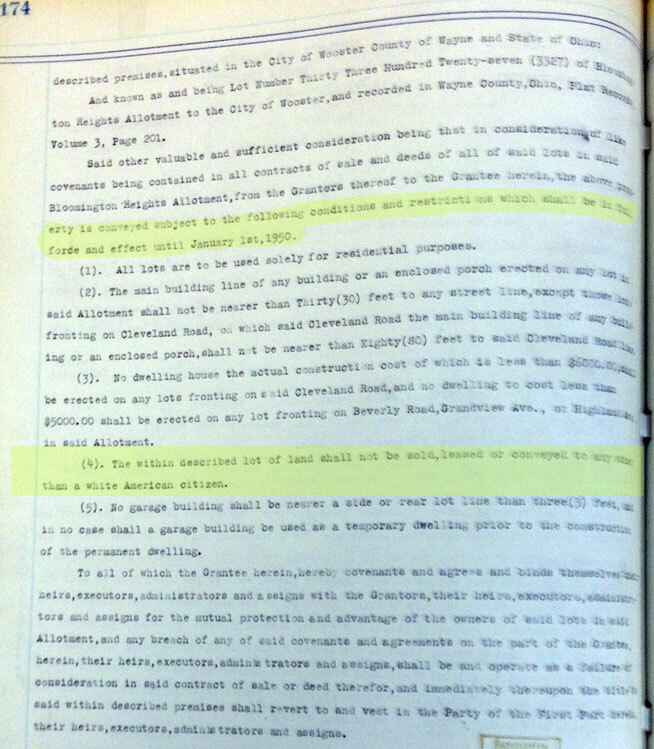 It is not known whether the previous land owners, the Barrett’s, put all of these restrictions in place or if the City of Wooster wrote the conditions on the land, but sadly Bloomington Heights was a segregated community until January 1, 1950. The house at 2006 Cleveland Rd. as it looks in 2014. The distinctive roof-line is gone and a porch has been added to the side of the house. Sometimes an architect’s original design does not hold up in actual living conditions and residents make necessary changes. Despite all the deed restrictions the Scott sisters “prize” house met all the requirements and was built on lot 3327. At the time the architectural design for the house was considered to be among the best of its type and arranged in an excellent manner. The house featured a total of seven rooms. A noted peculiarity at the time, was the fact that the kitchen was located at what most people would have considered the front of the house. It also featured a large living room and dining room that were in reality one room, as a large doorway connected them. Which was a very forward thinking design at the time. There were four bedrooms on the second floor. The square streamlined brick design outside showed no porches on the house and had only a patio on what would have been considered the rear of the house. The roof-line of the house was also very distinctive: instead of the roof protruding at the eaves over the walls, it ends inside the walls in much the same way as a business block or an apartment house has its roof built. In this case, however, the roof is slanting just as it is in an ordinary house but ends inside the outside walls. In addition, the house came with a detached two-car garage. Eventually the Scott sisters sold the house in March of 1945 to James D. McQuade and his wife Lois for roughly $13,000 according to the tax stamps on the deed transfer. The McQuade’s sold the house about nine months later to Henry W. Butterfield and his wife Marie for $14,500. In 1949, the Butterfield’s sold the house to Morgan G. Winget and his wife Katherine. The Winget’s lived in the house for the next 36 years until they sold it to Robert M. Pearce and his wife Mary for $71,000 in 1985. The Pearce’s kept the house for 28 years and sold in 2013 for $66,500 to GRS Real Estate LLC who have been working to rejuvenate the house.